Hello! Today I have another of my furry felt critter cards to show you. I love using pre- made felt images in my paper crafts. I think they add such a special touch to any creation. Now I usually buy these critters pre- made because I find them very inexpensive. But you could also very easily make these cute little guys yourself with felt and a pair of scissors. This raccoon was purchased in the fall at Hobby Lobby, so I'm pretty sure he is no longer available. My interesting card sketch is from Splitcoaststampers (SC360). I really enjoyed working with this sketch and ended up making several different cards with it that you will see in later posts. I popped the dotted card panel up on dimensionals to give my little raccoon more room to snuggle inside.n The paper colors are Very Vanilla, Basic Grey, and 'Dots and Stripes' from DCWV. I used a MFT die for the side border. I colored in the unknown sentiment stamp heart with a red gel pen. I just love that extra pop of color in the sea of neutrals. It is absolutely adorable... How original! Beautiful.... very creative. Those felt critters are so cute! Love your card, Amy! This is so cute Amy, and fabulous sketch. I too love the little bit of red! Fabulous design Amy, the felt raccoon is so cute. 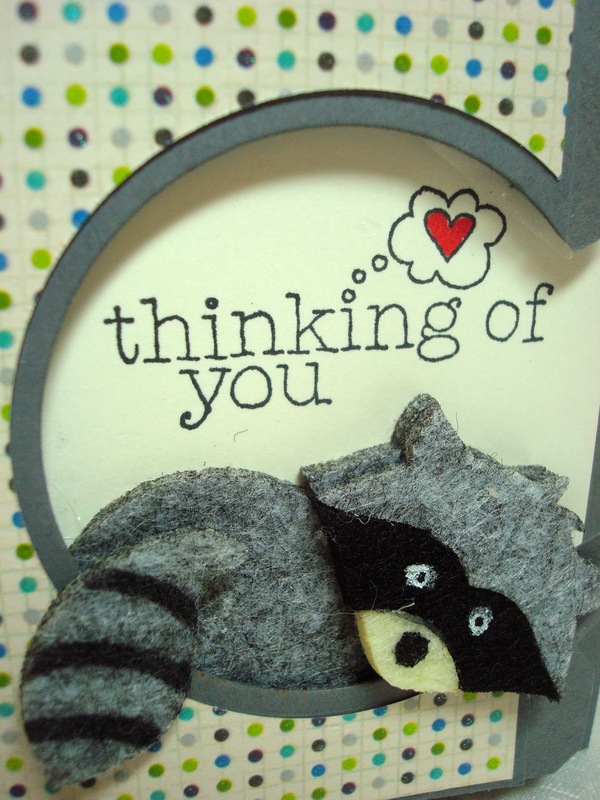 Love the design with the circle cut out of the border and the raccoon peeking through, fabulous card! Oh original card, love it very much !! superb design !